October has come and gone and I finally feel like we are solidly into the school routine. It feels good to know that I can get the lunches packed in 5 minutes flat and to have all the September butterflies dissipate. I feel so thankful for the new friendships we have all made and felt like celebrating with a batch of cookies. 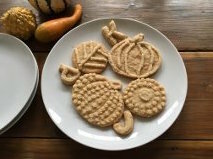 This fall, I thought I would switch up my usual roll out sugar cookie recipe and warm them up for fall. I added some whole wheat flour and brown sugar for a bit of a deeper flavor. I found the icing recipe while scouring the library for cookbooks. I came across one called Vintage Cakes and saw this Brown Butter Icing. I decided to add a hint of cinnamon (sugar and spice and everything nice right?) to add a little kick. Hope you enjoy them as much as we did! Browned butte with the milk solids at the bottom of the bowl. Adapted from Allrecipes.com. This is a half batch, but I find that it makes more than enough. If you want to double the recipe, you can always freeze the unused dough or if you decide to bake the whole double batch, you will want to double the icing recipe. The key to these cookies is keeping the dough cold and not overworking it. Whisk flours, baking powder, and salt in a medium bowl and set aside. 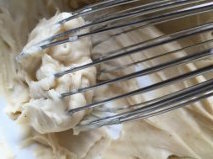 In the bowl of a stand mixer with the paddle attachment, cream together butter and sugars until light and fluffy. Add eggs and vanilla and beat until incorporated. Add flour and mix until combined. This dough is very soft so chilling it is very important. I chilled mine overnight but you could chill in the refrigerator for a couple hours as well. Once chilled, preheat oven to 400 degrees and lightly dust counter with granulated sugar (or flour). 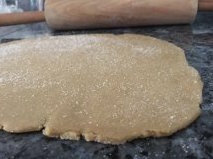 I used mostly sugar and it gives the dough a nice sparkle but since the dough is delicate, a little flour doesn’t hurt. Working in small batches, gently roll out dough to an even thickness of 1/8 – 1/4 inch. Keep the dough that is not being rolled out in the refrigerator. Cut out dough using floured cookie cutters and put on ungreased baking sheet. Once the sheet is filled, place back in the refrigerator for 10 minutes or until dough is firm again and then bake in over for 6-8 minutes. The bottom of the cookie should be golden but the top should still be pale. Cool cookies on a wire wrack. Repeat until all dough has been used. Adapted from “Vintage Cakes”. Makes enough to frost the above recipe. I used a pastry bag and tips to decorate but a spoon to swirl some on top would be just as great. Sift powdered sugar in a small bowl and set aside. In a small light bottomed pot, cut butter into tablespoons and melt on medium. Swirl occasionally to help the butter melt evenly. The butter will foam and turn golden, continue to cook until butter is dark and nutty smelling but without burning. It moves quickly so keep an eye on it. If you pour all the browned butter into the powdered sugar, the finished frosting will have browned butter flecks in it which was fine with me, but if you want a cleaner look, carefully pour off the butter and leave the milk solids behind. Pour browned butter into the powdered sugar and then add vanilla, milk or cream, and salt. Using a whisk or a hand mixer, mix until well combined. Add cinnamon to taste. The frosting will set as it sits. 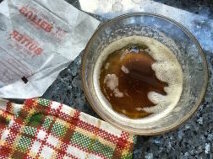 Once cool, pipe onto cookies or spread with a spoon. Enjoy!